Delivery times vary depending on the items ordered and the location of the delivery address. 90% of deliveries are made within 5 days and 98% of deliveries are made within 8 days and on occasions a small number may take a little longer but this is normally due to things like severe weather events. Most of our products are delivered on our own specially designed delivery vehicles this gives us greater control over delivery times and helps to prevent damage. We do use carriers to deliver some items as this can sometimes be the quickest method, unfortunately many items are not suitable due to their size and the possibility of damage. Due to physical size of the products we supply these have to schedule into a delivery run on the appropriate vehicle. We optimise all orders to ensure the most economical and environmentally friendly routes; this means that your order may take more than 7 days to arrive. 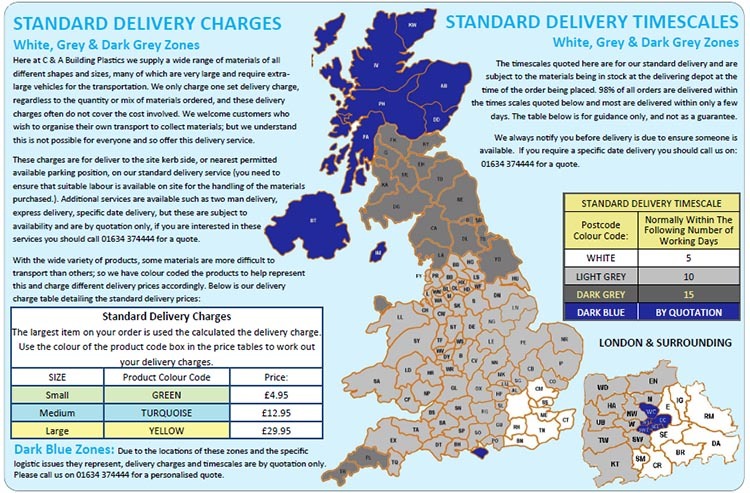 We cover most of the UK once a week but outlying areas might be every two weeks depending on the time of year and what day you place your order. Sometimes orders are dispatched within a day or two depending on when you place it.